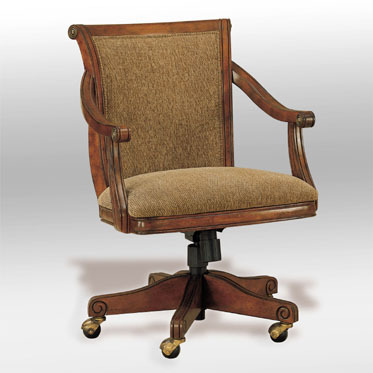 Description: This comfortable, generously sized, Castered game chair offers the user open curved arms with reeded supports, a sturdy hardwood frame with woven webbing supported seat and upholstered scroll back capped with decorative brass medallions. This sits astride a height adjustable gas cylinder on a 5 prong steel reinforced wood base with dual wheel casters. Finished in a lightly distressed warm cherry with a satin sheen. Upholstered in a resilient Light Brown 25% cotton, 75% polyester fabric. Base and caster assembly needed. Price $399.00 local area. Out of state shipping fees apply. If purchase 2 or more price will be packaged. If adding the Brandon table the set will be a package price. Call for pricing.